Solis Berewick is located in the new and desirable community of Berewick, Charlotte, NC. The urban community is centered around shopping, dining, and outdoor entertainment. Berewick has easy access to the Charlotte-Douglass International Airport, Charlotte Premium Outlets and major interstates. 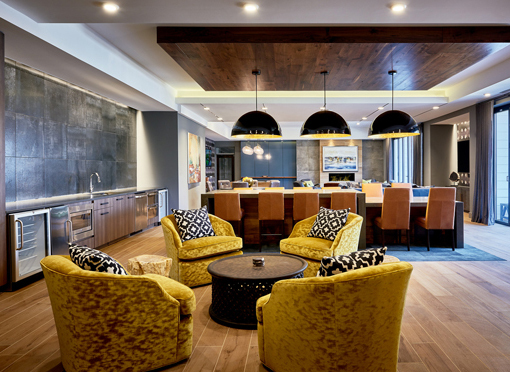 RJTR provided interior master planning, FF&E and consulting services for all public areas of Solis Berewick for Terwilliger Pappas Multi-Family Partners. 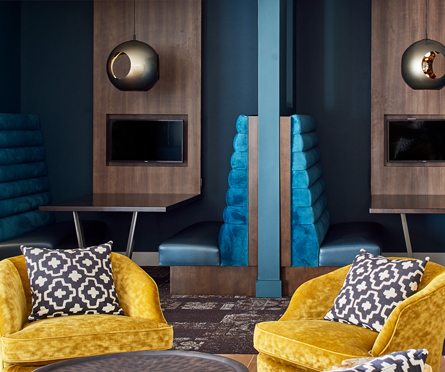 The amenity areas include a luxury hospitality approach leasing center, entertainment clubroom lounge with coffee café and communal printing, expansive wet bar/catering kitchen, communal dining, soft seating, and game tables. Other community amenity spaces include; ﬁtness center and private yoga room, pet spa, outdoor grilling and ﬁre pit, and a large pool with indoor/outdoor screen pavilion. The most unique feature of the club room is its connectivity with the exterior amenity areas through NanaWall folding glass doors. The total project consists of four garden style buildings with a total of 275 units, and 13,901 SF of Amenity Spaces.